Beautiful 1920s "flip up" shirt cabinet with 10 lift up doors concealing 48 pull out trays. 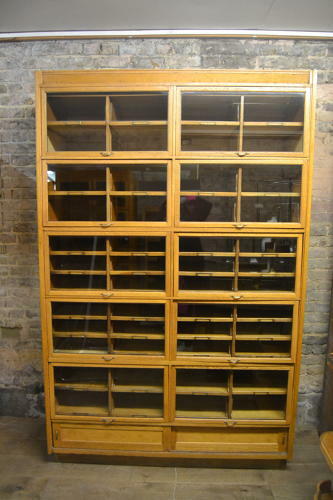 This cabinet is in immaculate original condition with original brass handles. One of the best models of it's kind. It also has a sliding door cabinet underneath. Ideal for storing and displaying clothes, material, paper, shoes, etc. etc.